There’s no one definitive way to measure success. When it comes to your job, you might rate your accomplishments by titles or a feeling of purpose in your day-to-day work. When it comes to family, maybe your vision of success is how happy your children are, or how well they do at school. Perhaps you consider yourself to be well-off by receiving a quality education and successfully paying off student loans. Even people we perceive as being overwhelmingly successful tend to have very different definitions of what makes them so great at the things they do. But what about money? What helps define our financial success? And how do these definitions change from millennials to gen xers and baby boomers? When someone says they’re well-off, you might assume that’s a polite way of indicating they don’t have to worry about money – but is that really the case? To help decode the truth behind this occasionally ambiguous adjective, we asked over 1,000 people from various backgrounds to define being well-off: from how much money they need in their checking and savings accounts to what being well-off affords them. Continue reading to see what we learned. At different stages in life, various sums of money can go from being perceived as quite a lot of cash to hardly enough to get by on. By that same token, financial gurus recommend increasing your target savings amount as you get older. The money you might need to cover an emergency in your 20s isn’t nearly as much as you’ll need for retirement in your 50s and 60s. So what does it mean to be well-off, and how much money do most people think they need in their checking or savings account to feel comfortable? Having an average of $4,177 in their checking accounts and just over $57,000 in savings met most respondents’ standard of being well-off. The idea of wealth isn’t the same for everyone, though. As we found, younger generations had a lower expectation of how much money they needed to consider themselves well-off. 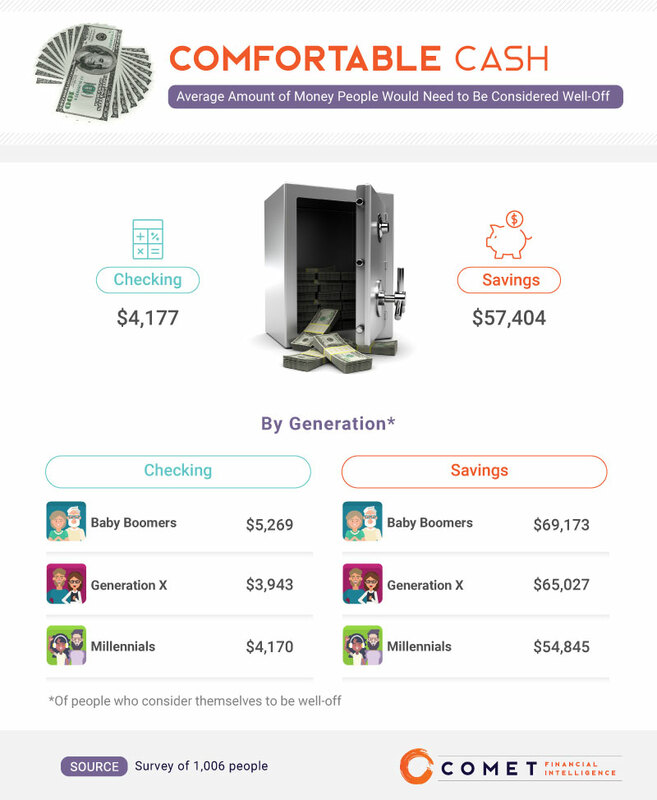 Gen Xers needed the least in their checking accounts (just under $4,000), while millennials required the least in savings ($54,845) to feel well-off. Baby boomers, who might be the closest to retirement age, had the highest expectations for both money in their checking and savings accounts – $5,269 and $69,173, respectively. If you’re heading into your golden years, experts suggest you could need as much as $1 million to retire comfortably. Millennials were the most likely generation to identify themselves as well-off. More than 2 in 5 rated their cash flow as more than adequate. While they also had average salaries of over $48,000, it was being debt-free, having the ability to pay their bills on time, and affording experiences that made them feel so well-to-do regarding their financial status. 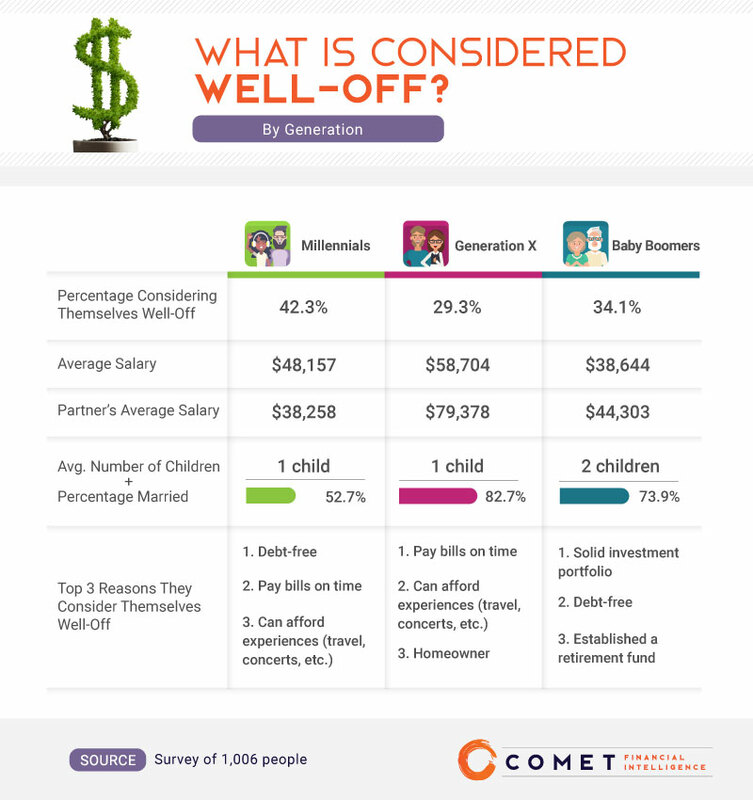 Despite earning more than millennials, Gen Xers had the lowest overall opinion of their personal wealth, with roughly 29% considering themselves well-off. Being able to pay their bills on time and affording experiences ranked among the most important factors in their perception, but unlike millennials, Gen Xers added being homeowners into the equation for financial success. Baby boomers might have earned less than Gen Xers and millennials, but they had very different perspectives on what constituted being well-off. Baby boomers were the only generation to list having a solid investment portfolio and an established retirement fund as being some of the most important elements for financial success. When it comes to finding happiness, how much money you have isn’t usually as important as what you’re able to do with it. In some cases, the more money people made, the less happy they tended to be. More than anything else, over 69% of people felt good about their monetary position when they could pay their bills on time. In reality, roughly half of Americans struggle to manage their financial obligations, whether it’s credit cards or student loans, without a clear resolution on how to pay them. Nearly as many felt well-off when they were debt-free, could afford experiences like traveling or going to concerts, or had established a retirement fund. In contrast, things such as starting their own business or enjoying the topic of money were less common indicators of feeling financially healthy. For people who’ve experienced debt, the overwhelming sensation of never-ending financial obligations can feel suffocating. Not knowing how to overcome the burden of bills and creditors can leave you wondering where to turn, but that doesn’t mean it can’t be done. Building an effective budget or consolidating your current loans are all options to help pay off pre-existing debts. Sixty-five percent of people believed they could still be well-off despite having student loan debt. Today, 70% of students graduate with a significant sum of student loans, meaning those payments have become a fact of life for millions of Americans. That wasn’t the only thing they had financial opinions on, either: 45% of people believed they were better off pursuing entrepreneurship than working for someone else, and more than 1 in 3 were under the impression that money really could buy them happiness. Still, people who consider themselves well-off may not necessarily agree. 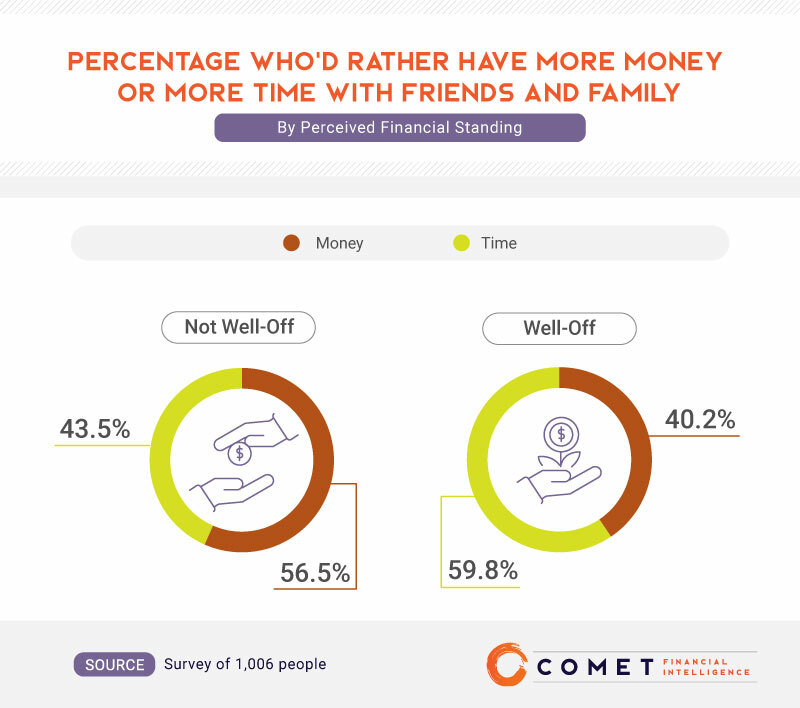 Nearly 60% of people who considered themselves well-off wanted to have more time with friends and family over having more money. Almost 3 in 4 people who classified themselves as well-off suggested making a budget. An effective budget means you won’t spend money you don’t have, and you’ll be prepared for whatever the future has in store. 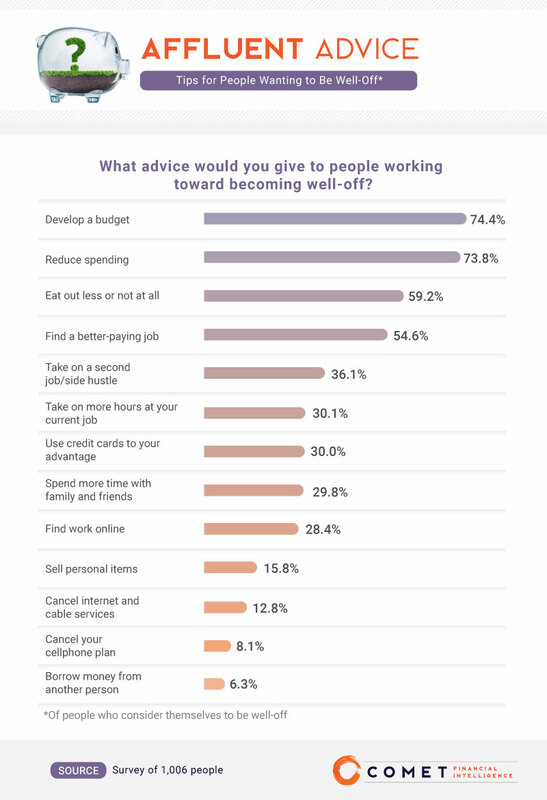 Keeping in theme with the importance of budgeting, nearly 74% of people who considered themselves well-off also said they’d recommend people reducing their spending followed by more than half who said to eat out less or consider finding a better-paying job. Having a nice meal out from time to time may not kill your spending strategy, but spending almost as much at restaurants and take-out as you do at the grocery store can be a recipe for financial disaster. What they were less likely to recommend was borrowing money from others or getting rid of things like a cell phone plan or internet services. People today tend to make more money than they have in the past. Of course, factors such as the basic costs of living have increased too, and even though people may have more money, they aren’t quick to consider themselves well-off. Still, that doesn’t mean they can’t get there. While everyone may have a different opinion on what it means to be well-off, many agreed that it is possible to feel good about your income even with debt like student loans. Many recommended building a budget and monitoring overall spending to feel more successful monetarily. At Comet, we know how much better life can be without a student loan payment. Instead of having to sacrifice the things you want or need, refinancing may be a smarter option for managing your finances today and in the future. Using our student loan refinancing calculator, you'll have instant access to potential savings and our list of recommended lenders. Don’t sacrifice what you need over what you want. Visit Comet to learn more. For this study, our team gathered 1,006 survey responses using Amazon’s Mechanical Turk. 11.1% of participants identified as baby boomers, 20.8% as Gen Xers, 15.5% as Gen Zers, and 52.6% as millennials. The participants ranged in age from 18 to 80 years old with a mean of 35 and a standard deviation of 12.8. Our team weighted the data to the 2017 U.S. census for age. All of the results rely on self-reported data, and participants were disqualified if they missed an attention check question or entered inconsistent data. How do you define being well-off? Feel free to share this question with your readers for any noncommercial purposes. Please ensure a link back to this page so that they can view the full study and have a better understanding of how people define being well-off in the U.S.